Octogenarian Haze Evans believes that curiosity is the collagen of the mind, staving off mental sags, droops, and wrinkles. She doesn't care that Society reserves its pompom waving and back flips for those who've yet to cross the 40-year line; as a newspaper columnist, she's got people to listen to, stories to write, thoughts to share. She feels privileged to write about the drama, comedy, tragedy, romance, mystery, and intrigue that exist—in varying degrees—in everyone's life, including her own. Haze began writing her columns in 1954 and to school myself on past current events, I occasionally Googled "What was happening in the year 19-- or 20--?" More often, I relied on a reference book called The Time Tables of History and just now, to make sure I got the title right, I pulled the book off its shelf and randomly turned to the year 1977 and in the "History, Politics" column, read "President Carter warns that the energy crisis in the U.S. could bring on a 'national catastrophe'; Americans must respond with the 'moral equivalent of war,' making 'profound' changes in their oil consumption." (Whoa, talk about prescient!) That's the lesson that was reiterated while writing this book: history can teach us valuable lessons, if we're only willing to listen. I don't want to give much of the story's plot away, preferring that you buy the book by the caseload (happy to provide an answer to all your gift-giving needs! ), but one of the last columns Haze writes before she's felled by a stroke (from which she may or may not recover) is about the upcoming 2016 presidential election. Her own mother's generation wasn't allowed to vote until 1920 (less than a hundred years ago! ), and that Haze might help elect the first American female president thrills and humbles her. In her columns, Haze writes from the perspective all of us have: as a citizen in our own small world and in the big world at large. The Vietnam War doesn't come close to touching her in the way it touches grieving parents who listen over and over to the Beach Boys' Pet Sounds because it was the favorite album of their killed-in-action son. In an '80s column about the emerging AIDS epidemic, she writes about Richard, a cherished childhood friend whose sexuality is ridiculed and mocked by other classmates. Her perspective endears her to many readers, but not to one particular Joseph Snell, whose world-view is rarely in focus with her own and who writes letters to the paper complaining about her work being "nothing more than the chronicles of a radical hag." After one column in which she ruminates on the practice of taking the husband's name after marriage, she receives criticism from him and others, and she ends a rebuttal column with a favorite cookie recipe. That begs a different kind of question: how many male columnists would feel the need to mollify irate readers by sharing recipes? The online world we're living in now hosts "trolls" who are literally underground (seeing as many of them write from their basement) and who criticize/excoriate/threaten anonymously, which of course is cowardly. At least pre-cyber, those writing in to fulminate against old-school bloggers—columnists—had the courage to sign their names. Of course, the sexism and ageism was most often directed at women (would Snell ever call a male columnist a radical old coot?). Sam, the fourteen-year-old son of the newspaper's publisher scoffs at the idea that "an old lady's columns" could interest him. Given (he'd say forced into) a summer job at the paper, he's tasked with going through archives and reading Haze's words as well as letters from readers. His evolution was satisfying to write about; he not only lets go of his own sexism and ageism but also leads his classmates in recognizing the worth of the words of Haze the person. 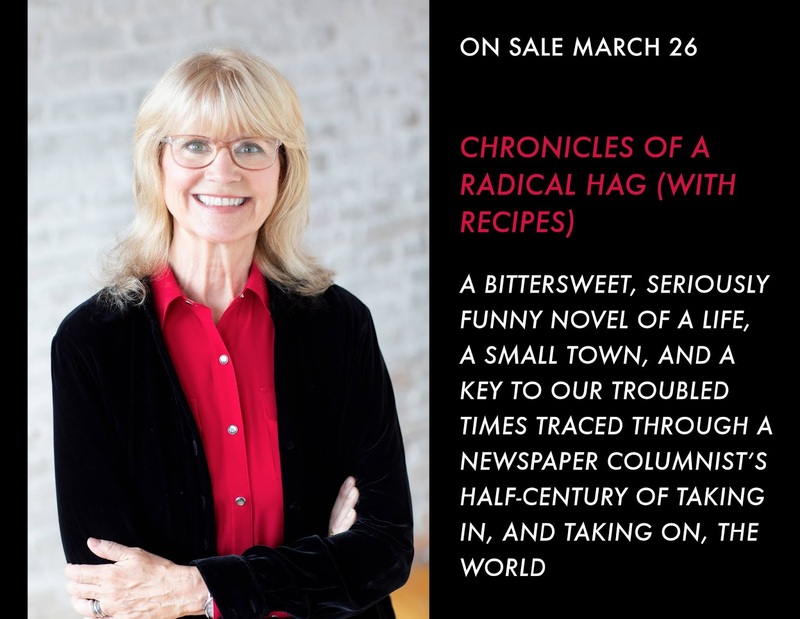 Chronicles of a Radical Hag (with Recipes) is a book about the value of all of our stories and of the voices that tell them. I hope it will make you laugh, cry, gasp, think, wonder, get miffed, get riled, and get inspired. And remember when making the almond crescents, a light touch works best. I would offer that as all-around good advice, except not to professional masseuses or boxers. 7:00 PM, Tuesday, March 26th, 2019. Hosted by Valley Bookseller at Trinity Lutheran Church (115 4th St. N., Stillwater, MN 55082). Tickets are $15 with $5 going toward the purchase of the book, and are available in person at Valley Bookseller or at www.valleybookseller.com. 7:00 PM, Wednesday, March 27th, 2019. Hosted by Excelsior Bay Books at Trinity Episcopal Church (322 2nd St., Excelsior, MN 55331). Tickets are $15 with $5 going toward the purchase of the book, and are available in person at Excelsior Bay Books or by calling 952-401-0932, or at https://www.brownpapertickets.com/event/4021530. A full list of Lorna's events can be found here.